Have you ever heard of forcing chicory plants? 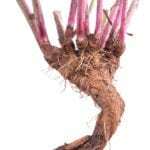 Chicory root forcing is a common procedure that transforms the roots into something marvelous. If you are growing chicory, and are wondering “should I force chicory,” the resounding answer is yes! Why force chicory? Keep reading to find out how and why you should force chicory. Chicory and endive are often used interchangeably, which can lead to some confusion. This is because the forced product of Witlook chicory is also called French or Belgian endive. Endive is grown for its leaves, which are used as salad greens or are cooked while Witloof chicory is forced for chicons. Why force chicory? Because forcing a chicory plant begets an altogether sublime, tender, sweeter product that makes eating them an almost transcendent experience. Like many discoveries, chicory root forcing was a happy accident. Almost 200 years ago, a Belgian farmer accidently came upon some chicory root that he had stored in his cellar, which had sprouted. Normally, the chicory was being cultivated as a coffee substitute, but this fortuitous event catapulted chicory into a whole new category when the farmer sampled the pale white leaves and found them to be crispy and sweet. 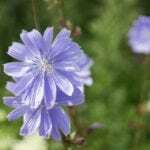 After a few decades, forcing chicory to form chicons, the tightly cupped heads of pale leaves, became fairly commonplace, especially to people who live in snowy climates where fresh veggies are hard to come by. With enough roots and a bit of planning, gardeners can force chicory throughout the winter months. Chicory is harvested for chicons about 130-150 days from planting when the roots are large enough to be forced, which is generally from September through November. The white section of the root should be at least ¼ inch (6.35 mm. ); if it is any less, it will not produce tight chicons. Dig the roots up and cut the foliage down to an inch (2.5 cm.) and snip off any side shoots. Select a tall container; it could even be a plastic bag, which is deeper than the longest root. Fill the bottom of the container with a bit of mixed sand and peat or compost. Stand the roots up in the medium and fill the container up with more mixed sand and peat or compost. Ideally, top the container with medium to 7 inches (17.5 cm.) above the crown of the chicory. The planting media should be lightly damp. Keep the container in the dark in a temperate area with temperatures 50-60 F. (10-15 C.). Darkness is imperative. If the chicory roots get any light, the resulting chicon will be bitter. The white buds of the chicon should begin showing in around 4 weeks. When ready to use them, snap them off close to the root and then replace the container back in the dark for a second smaller, crop. Read more articles about Chicory.